Before I had a family and had slightly more disposable income, I rarely took a homemade lunch into work. I’d usually pop out to the local sandwich shop, or on a Friday I might join colleagues for a pub lunch and a shandy. Those were the days! Keeping a lid on our food budget means preparing a packed lunch most days, for me and my husband and the girls. And very often that means making the most of the leftovers from the night before. But lunchbox leftovers don’t need to be dull, and they don’t need to be a case of simply reheating last night’s dinner. I’ve teamed up with Most Wanted, the lifestyle magazine from money-saving site VoucherCodes.co.uk to devise a recipe that demonstrates how you can spend just a tenner on a delicious family meal for four that can then be magically transformed into a deliciously different lunch the following day. The good folk at Most Wanted are keen to help people make the most of their money without compromising on life’s little luxuries. While a trip to the local deli might be a nice treat, regularly spending £5 on a salad or panini can’t be cost-effective. So they’re on the search for tasty recipes that create an abundance of leftovers you can eat for lunch without it costing a fortune. I love a roast on a Sunday and, what’s more, they are ideal for leaving you with heaps of delicious leftovers for versatile weekday lunches, from soups and curries to sandwiches, wraps and salads. Personally I like to play with my leftovers a little, so I don’t find myself growing bored eating the same dish again and again. 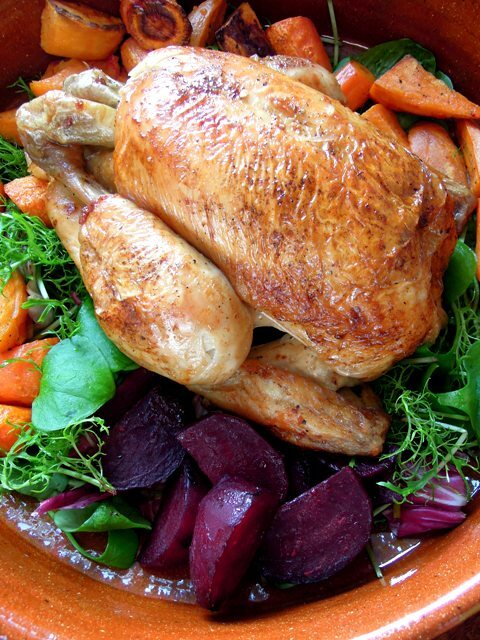 This lemon roast chicken with beetroot, carrot and sweet potato is a colourful and cheery take on a roast dinner, making the most of those seasonal root vegetables. The veggies are roasted along with the chicken for an incredibly easy meal, full of rich, sweet, caramelised flavours. 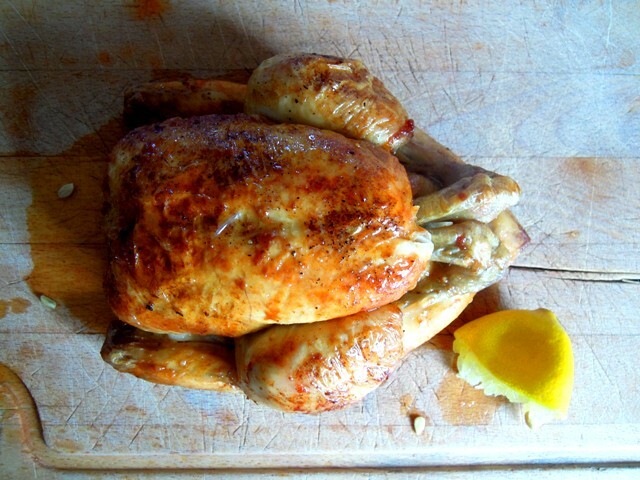 To give the chicken its incredibly fresh, vibrant flavour, I roast it with half a lemon stuffed inside, and then when the cooked chicken is resting, I squeeze the juice of the other half all over the skin. It’s so simple but it tastes glorious. Then to turn the roast into a different dish for Monday lunch, I’ve used the leftover meat and vegetables in a tasty bulgur wheat salad with fresh mint and coriander and lots of nutty, juicy pomegranate seeds. 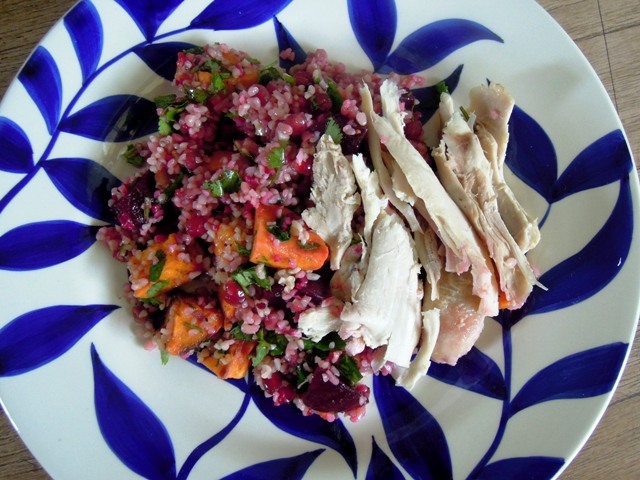 The colours are fantastic and I love the way the beetroot juices soak into the bulgur wheat turning it pink. What’s more, you should also have enough chicken left over to cook up a soup for Tuesday lunch, making a stock from the chicken bones. And all this for under £10. Pretty good, eh? Sit the chicken in a roasting tin. Cut the lemon in half, and then one of the halves into quarters. Place the lemon quarters inside the chicken cavity and sprinkle some salt in there too. Rub the butter over the skin and sprinkle with some more salt. Put the chicken in the oven and roast for around 1 hour and 20 minutes, or until the juices run clear when you poke a sharp knife into the thickest part of a leg. If the skin is browning too quickly, cover with a sheet of kitchen foil. Peel the beetroot, carrot and sweet potato. Cut the beetroot and sweet potato into wedges, and slice the carrot into similar sized chunks. Place the beetroot onto a sheet of foil and drizzle over a little olive oil and a grind of salt and pepper. Wrap loosely and place in another roasting tin. Place the carrot and sweet potato at the other end of the tin, and similarly drizzle with oil and a little salt and pepper. Mix it up with your hands to make sure the vegetables are well coated. Put the vegetables in the oven once the chicken has had around 50 minutes of its cooking time. Roast the vegetables for around 40 minutes, until they are tender and beginning to brown. When the chicken is out of the oven, sprinkle with a little more salt and squeeze the juice from the other half of lemon all over the crispy skin. Leave to rest for 10 minutes before carving. 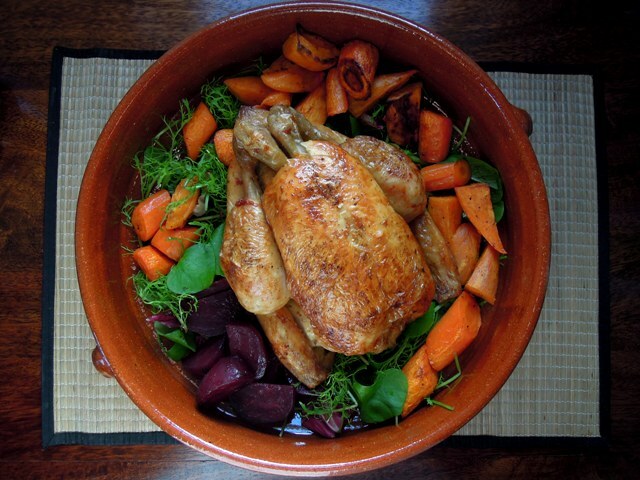 Serve the roast chicken and vegetables with a simple leaf salad. There’s no need for any dressing; simply pour over the lemony roast chicken juices. 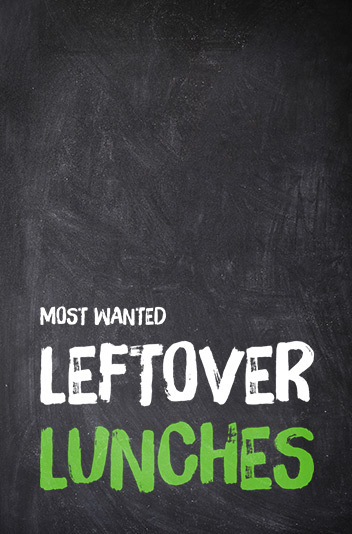 Don’t be greedy now – make sure you leave enough chicken and veggies for tomorrow’s lunch. Rinse the bulgur wheat and place in a large bowl. Cover with boiling water to at least double the height of the bulgur wheat, and leave for 15 minutes. Drain the bulgur wheat and leave to cool. To assemble the salad, simply place the bulgur wheat in a large bowl with the vegetables, fresh herbs and pomegranate seeds. Squeeze over the lemon juice and drizzle with a little olive oil. Season to taste. Mix it all together gently. Taste and adjust the seasoning if required. If you’re serving this straightaway, lay pieces of shredded chicken on top of the salad and bring to the table. If you’re taking the salad to school or work for lunch, I share the salad between the plastic boxes and then place the torn pieces of chicken on top before popping the lid on. For some reason, I prefer to keep the chicken separate to the rest of the salad, but feel free to mix it all up together if you like. So there you have my two ways with a roast chicken. How do you use your Sunday roast leftovers? Disclosure: This post is sponsored by VoucherCodes. I received a fee to buy the ingredients and develop the recipes. As these recipes are a brilliant way to ensure you reduce your food waste, I’m entering them into this month’s No Waste Food Challenge hosted by London Unattached and Elizabeth’s Kitchen Diary. Ah, my favourite thing is to make more than I need and do brilliant things with the leftovers. Thanks so much! Aren’t leftovers brilliant? Pretty good? More like damn fine my friend, damn fine! that looks absolutely gorgeous! and a great way to use up the leftovers during the week! I want to jump right into that first photo – oh goodness gracious this looks yummy!